Miami snaps a four-year drought against San Antonio, winning for the first time in 12 games. 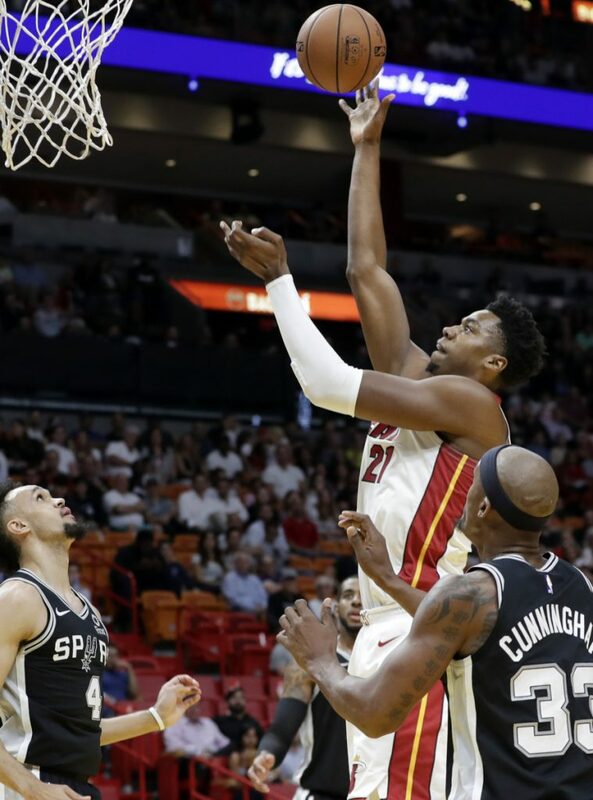 MIAMI — Hassan Whiteside had 29 points, 20 rebounds and an NBA season-high nine blocked shots, and the Miami Heat snapped a four-year drought against San Antonio by beating the Spurs 95-88 on Wednesday night. Wayne Ellington scored 20 points and Justise Winslow added 16 for the Heat, who had dropped their last nine regular-season games to the Spurs – and 11 consecutive games overall in the series, when factoring in the 2014 NBA Finals. Patty Mills came off the bench to score 20 for San Antonio, which dropped its second straight. THUNDER 95, CAVALIERS 86: Dennis Schroder scored a season-high 28 points in replacing injured star Russell Westbrook and Oklahoma City won at Cleveland. Westbrook sprained his left ankle Monday, but the Thunder withstood Cleveland’s fourth-quarter run without the two-time MVP to win its sixth straight game after starting the season 0-4. Cleveland (1-10) rallied from an 11-point deficit early in the fourth quarter to go ahead. Oklahoma City led 78-67 before the Cavaliers went on a 13-0 run. J.R. Smith and Kyle Korver each hit two 3-pointers and the Cavaliers led 80-78 with 7:02 remaining. Alex Abrines’ 3-points shot from the corner gave the Thunder to break 84-all tie 4:31 to play, putting Oklahoma City on top for good. KNICKS 112, HAWKS 107: Tim Hardaway Jr. scored 27 of his 34 points in the second half, reserve Enes Kanter added 17 points and 11 rebounds, and New York won at Atlanta. PELICANS 107, BULLS 98: Anthony Davis had 32 points, 15 rebounds and blocked four shots in his best game since spraining his right elbow nearly two weeks ago, and host New Orleans ended a six-game skid. Zach LaVine scored 22 and for Chicago, which has dropped 5 of 6. PISTONS 103, MAGIC 96: Andre Drummond had 23 points and 19 rebounds and visiting Detroit broke a five-game losing streak. 76ERS 100, PACERS 94: Joel Embiid scored 20 points and Ben Simmons nearly posted a triple double to lead Philadelphia to its first road win this season. Simmons had 16 points, 10 rebounds and eight assists as Philadelphia ended a five-game losing streak on the road. The 76ers also snapped an eight-game losing streak at Bankers Life Fieldhouse that dated to April 2013. Victor Oladipo scored 24 points in the first half on 10 of 16 shooting and finished with a season-high 36 points for the Pacers. NUGGETS: The NBA center Nikola Jokic $25,000 for using derogatory and offensive language during a postgame interview.